Pig carcasses are not skinned after exsanguinations. Instead, the carcasses are dropped into scalding water which loosens the hair for subsequent removal. 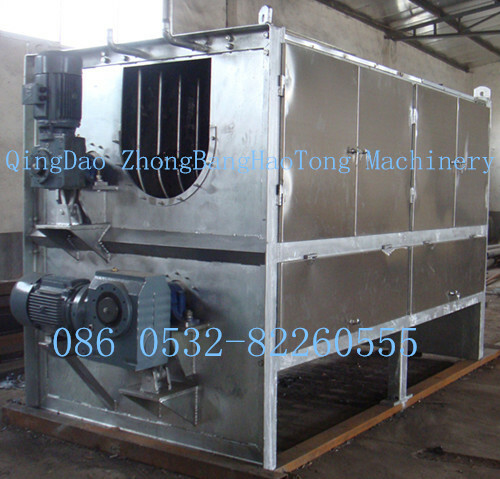 This abattoir equipment is widely used in large and medium-sized slaughter plants or butcher houses. The carcasses should be kept under water and continually moved and turned for uniform scalding. 1. It is the indispensable equipment for large slaughterhouse. 2. It is the pre-processing equipment for dehairing. 3. Improved dehairing effect is achieved by using it. 4. It is complemented with scalding machine and scalding tank. ZBHT Slaughtering Machinery Co.,Ltd. manufacturing high-quality Spiral debristling machine and supply OEM, ODM service according to your personal requirement. Our Spiral debristling machine and other Pig Slaughtering Equipment is not only good in quality but also competitive in price, welcome to inquiry us about the details of Spiral debristling machine or other slaughtering machine products and accessory equipment.